Russian gas monopoly Gazprom has proposed to pay for gas transit through Ukraine using debt owed by Ukraine's national oil and gas company Naftogaz. According to experts, this decision is advantageous for Kiev, since it will speed up the renewal of gas supplies to Ukraine. Gazprom has suggested introducing changes to Russia's legislation in order to be able to pay for gas transit through Ukraine using outstanding debt owed by Ukrainian oil and gas company Naftogaz, reports Interfax, the Russian news agency. Gazprom wrote a letter to Russian President Vladimir Putin, who has already asked the government to review the question, with a request to permit the netting of demands on the payment for transit and gas. According to Interfax, all the key organs, including the Ministry of Finance, the Ministry of Economic Development and the Central Bank, have given their support to the request. If the request is approved, it could help the Russian company improve financial indicators related to Ukraine's non-payment of its gas debt. Gazprom says that the debt is $5.3 billion. "The decision on the whole seems justified since it will help reduce abuse by the Ukrainian side," says Alexei Kozlov, chief analyst at UFS IC. "Moreover, the proposal may also turn out to be advantageous for Kiev because it may help it overcome one of the key ‘stumbling blocks’ in the trilateral negotiations on gas supplies to Ukraine." In Kozlov's view, Ukraine has little money and simultaneously extinguishing its debt and paying for new gas supplies may be difficult. "If a part of the debt can be used to cover the transit payment, it will make the payment for new supplies much easier," notes Kozlov. Gazprom had already noted in its second quarter accounts that due to Ukraine's large debt, "non-monetary forms of gas settlements with Ukraine" might be introduced, but the meaning of the statement was unclear at the time. Before, Gazprom would always pay for transit in advance, and the transit price depended on the gas price for Ukraine: The higher the gas price, the more expensive the transit, and vice versa. But since Ukraine has demanded a gas price of $268 per 1,000 cubic meters while Gazprom was asking for $485, each of the sides values the transit price in its own way. 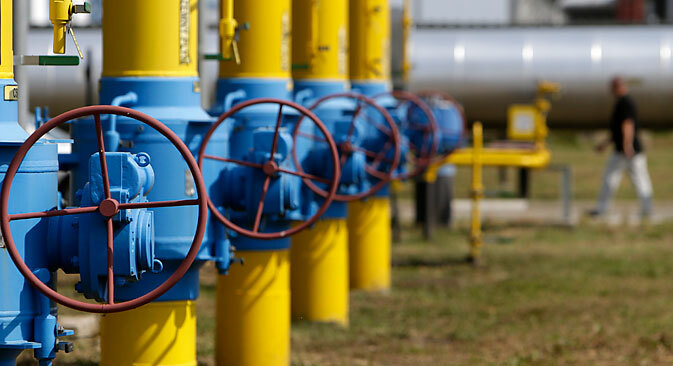 According to Gazprom’s accounts, its advance for transit gas finished in the middle of July, whereas according to Naftogaz the advance has still not been chosen. Gazprom has already tried paying extra to Naftogaz, but the Ukrainian company returned those payments to Gazprom. "The possibility of paying for transit gas through Ukrainian territory through the netting scheme would be good for Gazprom, since it would improve the company's financial position," said Investcafe analyst Grigory Birg. In June 2014, due to irregular payments for gas, Gazprom switched Ukraine to a pre-payment regime. Since then virtually no gas has been supplied to Ukraine because of the earlier debts. Gazprom says that Ukraine's total debt is $5.3 billion. Only during the trilateral meeting between Russia, Ukraine and the EU on September 26 did it become possible to agree to the renewal of Russian gas supplies to Ukraine. According to the European Commissioner for Energy Gunther Oettinger, Ukraine agreed to pay $3.1 billion of the debt and Russia agreed to renew gas supplies at a price of $385 per 1,000 cubic meters. But the agreements are temporary and in six months the sides will have to return to the negotiating table. The European Commissioner said that Ukraine will have to pay the $3.1 billion to Gazprom by the end of the year. In turn, the Russian company undertook to supply Ukraine with five billion cubic meters of gas and offer an option for a further five billion cubic meters. The payment will be made in two stages: Ukraine will pay two billion dollars by the end of October and $1.1 billion by the end of 2014, said Oettinger.